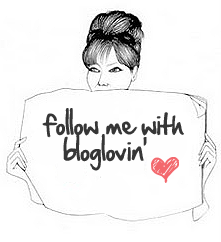 Hi charmed ones, so sorry for not posting for so long as I have been enjoying the European summer – did you miss me? It wasn’t a huge wedding as they were doing the civil service this year and having the church wedding next year. It’s exactly what my husband and I did too. Here in Austria you need to do the civil service first before heading to the church (that is if you want a church wedding). Some couples kill two birds with one stone and have it done all in the one day and others, like myself and my friend, get the contract signed paper work done then allow ourselves time to plan for the big celebrations. 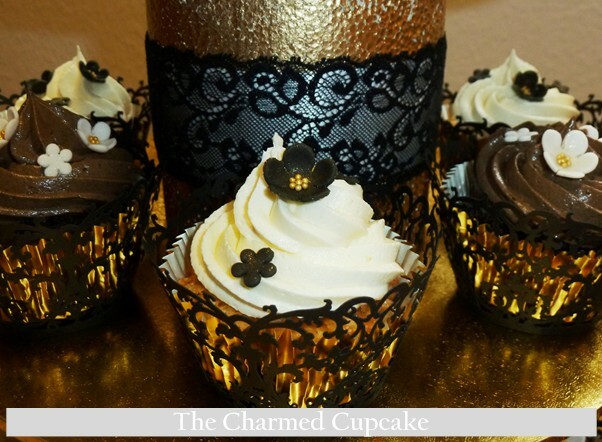 My girlfriend’s theme was black and gold and she wanted half vanilla and half chocolate – the recipe for the cupcakes can be found here. Black fondant is not readily available here so I had to colour my own. I had to do this a few days in advance before cutting the flowers so that the colour had time to develop. I basically added drops of black food colouring to white fondant till it became jet black, wrapped it in plastic and let it sit at room temperature over night. 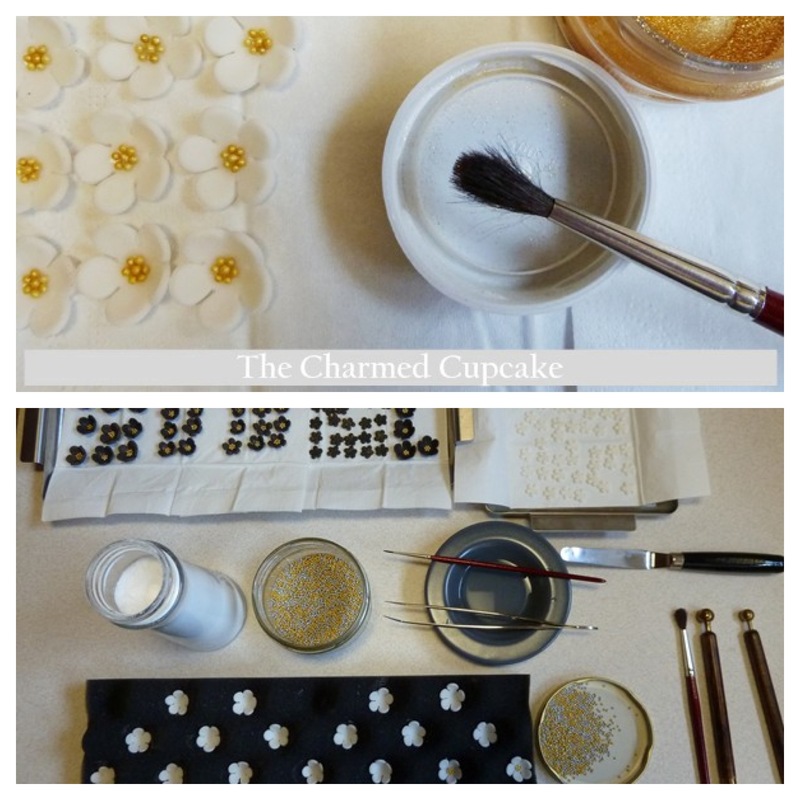 For those who have never worked with fondant, water acts as glue – a little goes a long way. A very delicate process. 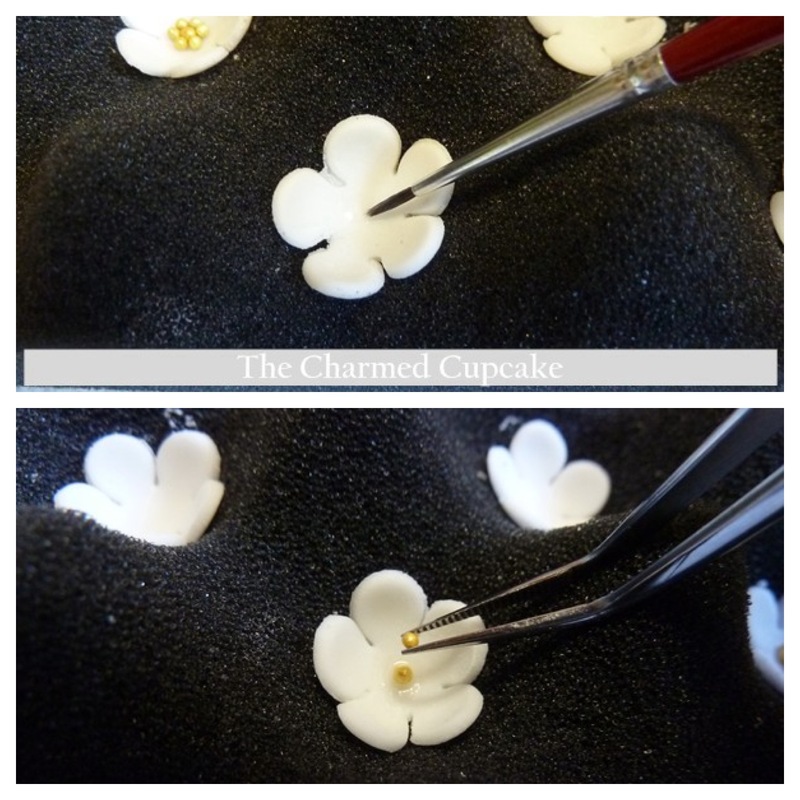 To give the flowers a bit of a shimmer I dusted them with gold luster dust. I made the flowers a week before the big day to give them enough time to dry and harden. 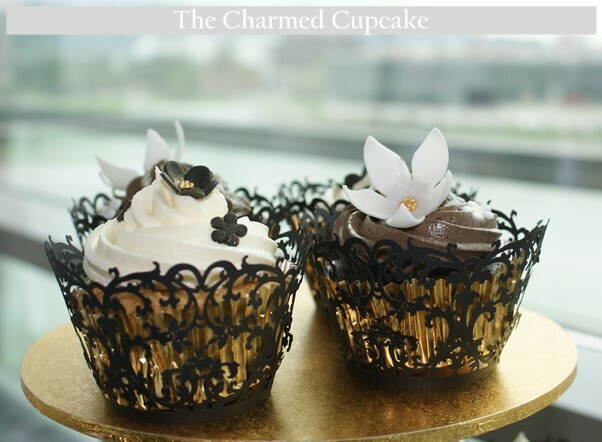 I found these beautiful black paper cupcake wrappers with a delicate lace cut design on line and knew immediately they were right for the wedding. 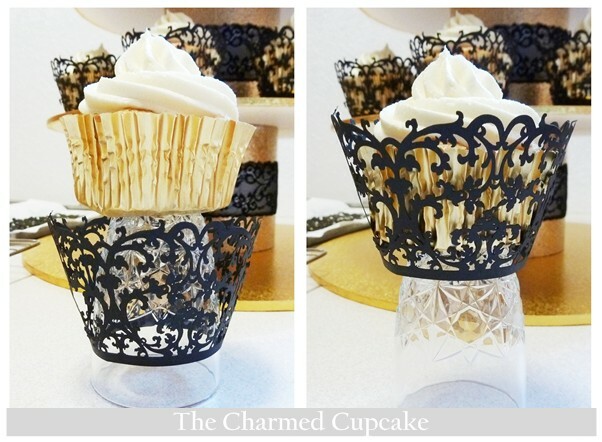 Here is a little tip on how to dress a cupcake with cupcake wrappers. Using a small glass (a shooter glass) place the wrapper over the glass, the cupcake on top and the slide the wrapper up. 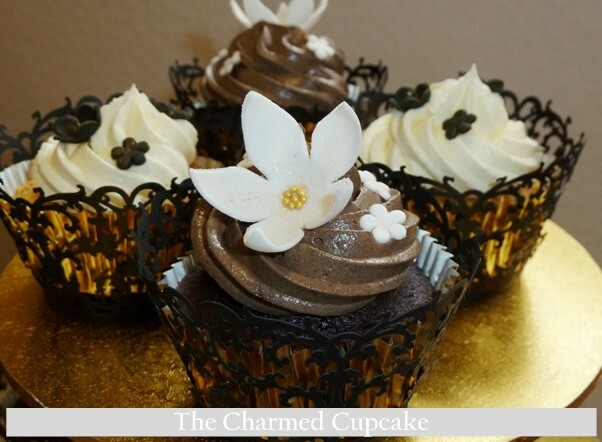 Of course you can just drop the cupcake into the wrapper but it won’t always sit straight and the frosting might get messed up. With such a delicate wrapper, I found this was the best way to go about it – quick and easy. 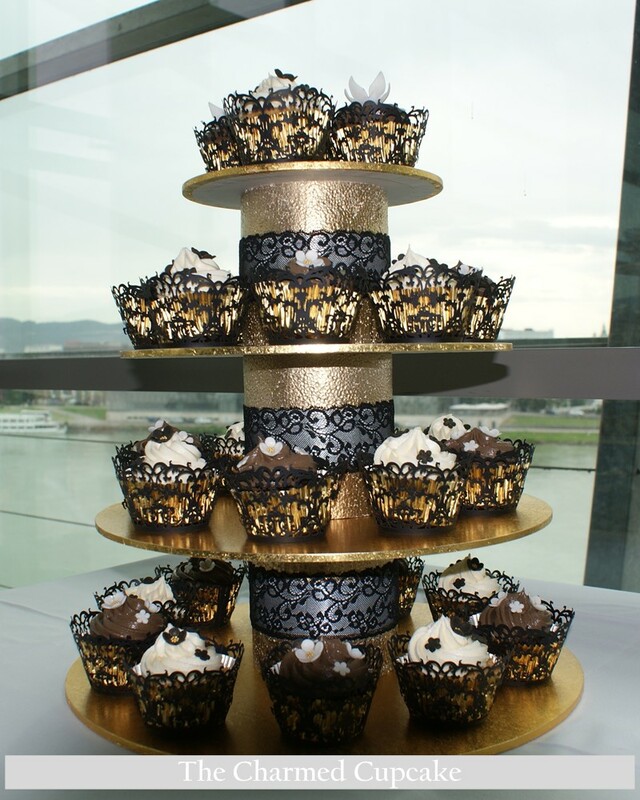 The gold cupcake tower was another one of my DIY projects. 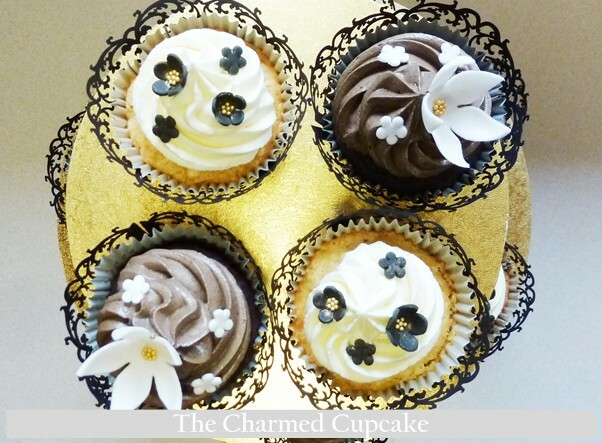 It was actually my wedding cupcake tower with a cream coloured satin ribbon – you can see it behind the black lace which I bought a the local craft store and pinned it over the satin ribbon. Congratulations to the married couple!! I was told the married couple along with their guests devoured the cupcakes with joy. Thank you Heather. I ordered the lace holders on ebay. Wow, these are absolutely stunning! Thank you so much! That means so much coming from a patisseie store 😉 you have amazing cakes and pastries. I love your croquembouche. I tried to make one once but it didn’t work out so well (the tower) but I do love to make the choux pastry. These are simply breathtakingly beautiful, Angela! You are very good at decorating! I just love to bake, but have no patience for decorating, and no talents whatsoever in that direction! Kudos to you! The cakes are just too beautiful to be eaten! LOL! They are so gorgeous, Angela! I love the black, gold, and white theme. Huh, you’re selling me on cupcakes. Maybe I’m missing out! Those look great! 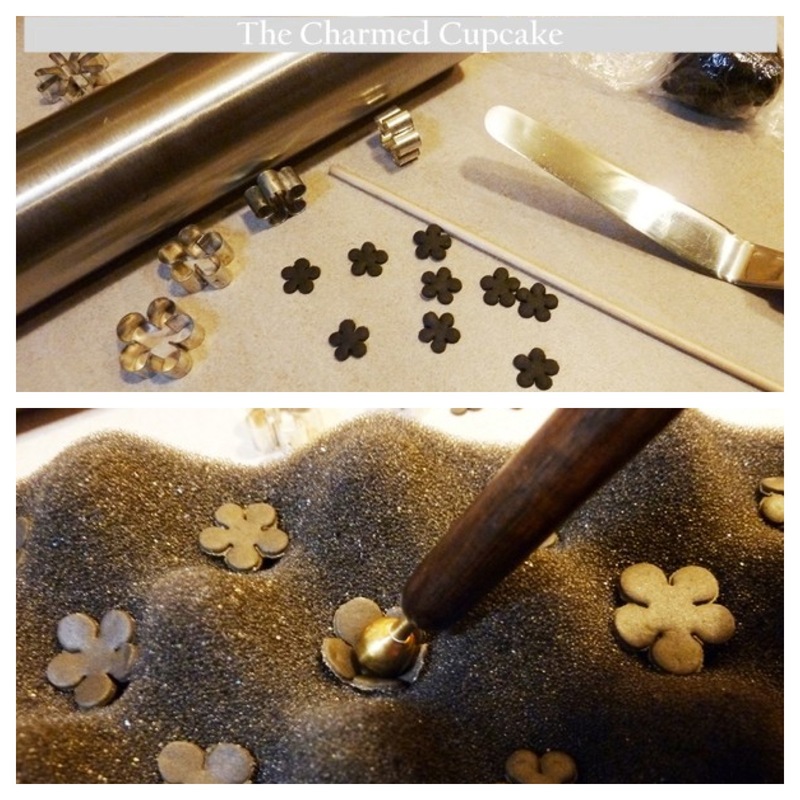 And that cupcake wrapper trick? LOVE IT. I would have taken the hard way and attempted to drop it in, inevitably ruining the frosting. Beautiful cucpakes! I know I use to do the same too until I found this little trick. Those came out so beautiful that I hope they didn’t upstage the bride!! 😉 Lol! Just kidding…. But I bet the happy couple were very pleased to have something so special at their wedding!